A lot changed in our sport for 2003, Shamrock park had gone, Davy McCall had brought investment to Nutts Corner as well as a second night of racing to the Co. Antrim venue. It�s an age old debate that this may have been the ruining of a great F2 track, but when you look back now at the way the circuit was, do you think the clipboard brigade would not have shut down the old track by now in today�s bubble wrap society? While many look back at the track that was, that offered close racing for small fields of cars, the new wall around the track softened the impact when a car went into it, on both the car and the wallet, and throughout 2003 car numbers soared from the mid teens to the mid twenties. 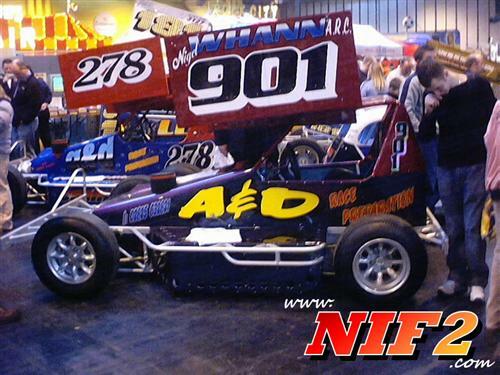 For me and the site 2003 started almost immediately, taking in the Autosport show for the first time in January, where Ian Thompson and Big Ted had their new A&D cars on display, alongside the latest Randall offerings and the new HCD of World Champion Chris Burgoyne. In a show that is the mecca of Motorsport, it was fantastic to see our wee country and our wee sport represented at the show. With the old Nutts Corner banished to the History books, all F2 roads led to Taunton, where every local F2 fan had the same thought�. It�s about the same size as Nutts Corner was, we could do well here. I travelled with Gary Beggs to Taunton for their opening meeting of the season, which was a tribute to F2 Legend Roy Goodman. Beggs got a few top 10s at the meeting, detoured to Birmingham on the way home, picked up the Stock kart, and we missed our boat the following morning. As has become traditional, the season kicked off on Good Friday at Ballymena, and the Stock Rods Yokohama tyres championship was the first up for grabs, with the win going to Victor McAfee. Nuttscorner Oval opened on Easter Saturday, with Neil Capper taking the Junior opening heat, and the first race at the track with it�s new layout. The meeting was the qualifying heats for the �King of Nuttscorner� championships which would be held on Easter Monday (and clashed with Ballymena), Shane Murray won the Junior King of Nuttscorner, Alan Wilson won the 2 Litre Hot Rods, Stephen Emerson won the Lightning rods and Andrew Stewart took the Production car win, while at Ballymena it was Alan Connelly who took the honours in the Stock Rod Irish Open. The F2�s kicked off the following Wednesday at Nuttscorner, by which time Ian Thompson had already a number of good results under his belt as he attempted to qualify for the World final through the mainland route. 21 cars made it out for the opening night. Colin McCready took the opening heat win, with Gavin Fegan taking heat two, and Graham Fegan took the opening final after an engine change following a blow up in practice. On the night Glenn McDowell won the juniors and Philipo Beattie won the Production car final. Jason Winning and Jeff Minish took the remaining finals in April. May started with a trip to Cowdenbeath for several NI cars, a trip which ended with a dark cloud over it as the sport lost a great saloon driver in Raymond Gunn. RIP 228. Andrew Stewart, Gavin Fegan, Gary Beggs, Jeff Minish and Jason winning all took final wins in May, when it was also announced that Nuttscorner Oval would become a full ORCi track later in the year, which would also bring an end to clashing meetings. June as ever is Irish Open time, but before that Criag McConnell had won a final, while Gavin Fegan and Ian Thompson had taken hat tricks of wins. The Irish open was at Nutts Corner and the visitors list included Bill Batten, the Stephen Brothers, Gordon Moodie, Trevor Harris, the Kelly Brothers, Bryn Tootell, Trevor Calvin and Chris Roots. On the night our cars didn�t get a look in, with Batten taking two heats and the Grand National, with Tootell taking the other heat and Graham Kelly taking the Irish Open. Although it wasn�t a local win, it was still a popular victory, given the amount of times the Kelly�s have come to Northern Ireland. On to Ballymena and the Irish challenge, Gordon Moodie took the opening heat, with Ian Thompson taking heat two. Thompson went on to take a controversial win in the final, after he was involved in a race stopping incident, rejoined at the back under the caution, before being moved up to second, where he went on to take the win. Davy McCrory became the second local winner on the night with a win in the Grand National. Craig McConnell took the remaining final win in June, while Neil Hooper became European Champion at Northampton. McConnell and Gavin Fegan took finals in July, while Thompson was still tripping up and down the mainland, improving his world semi final grid position, and eventually giving him an outside front row spot for his semi. Jeff Minish took third spot in the Scottish Championship behind Gordon Moodie and Barry Goldin. Away from F2, Mark Keys won the ORCi Championship for the Lightning Rods at Ballymena, and while it wasn�t officially branded a Speedweekend, the first 2 day meeting at Nuttscorner Oval took place, with Dave Longhurst winning the British Masters and Irish Open in the 2 Litre Hot Rods. Back to a busy month in F2 and into August, Joe Yates arrived from Karting to join the F2 scene, and took the first final of the month. Richard Dickey became another low grader to take a final win, Graham Fegan took a Ballymena final, Ian Thompson, Andy Stewart and Davy McCrory all took final wins, with Yates and McCrory doubling their tally before the month was out. On the mainland Thompson didn�t finish in his semi final, and the season long campaign now left his only hope of a world final spot being the consolation semi final at Taunton. September as with August began with a final win from Joe Yates. Andrew Stewart took the following Nuttscorner final, before we all uprooted and headed to Taunton, in search of the Gold roof. All credit to Taunton, they did the overseas qualifying in what I believe to be the most sensible manor for stockcar racing, they match raced the oversees entries. It makes no sense to me, why you�d do hot laps to book your place on the world grid in a contact formula. Along with our qualifiers that weekend, Gary Grattan and Denver Grattan who might even have been making his debut in the class, Davy McCrory, Andrew Stewart and Ian Thompson, who still had the consolation semi final to go, were all in action. Thompson was first to fall, while running well up in the consolation semi, he clipped the tyres on the infield, damaged a wheel and that was that. As one door closes another opens, and a low show from the Dutch entry opened the door for more NI cars to get onto the grid, with Davy McCrory and Andrew Stewart now in the big race along with the two Fegans and Jeff Minish. Against the odds, Barry Goldin took the world final, despite Bill Batten being the hot tip and the pre race favourite. With the world final behind us for another year, Davy McCrory took two final wins in the remainder of the month, with Ian Thompson finally landing the illusive Irish closed championship. September was rounded off with Alan Connolly winning the Stock Rod world final at Cowdenbeath. In the days when F2�s raced into October, Davy McCrory took the Ballymena stadium championship, Graham Fegan and Trevor Moore took Nutts Corner finals, before McCrory took the last final of the season there too. Gavin Fegan was crowned points champion.